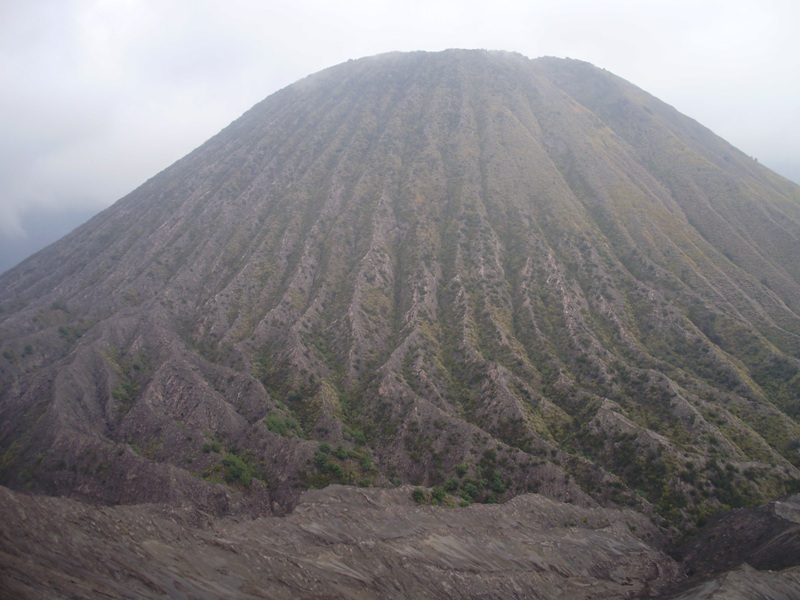 Mount Bromo is an active volcano and part of the Tengger massif belongs to the Bromo Tengger Semeru National Park. 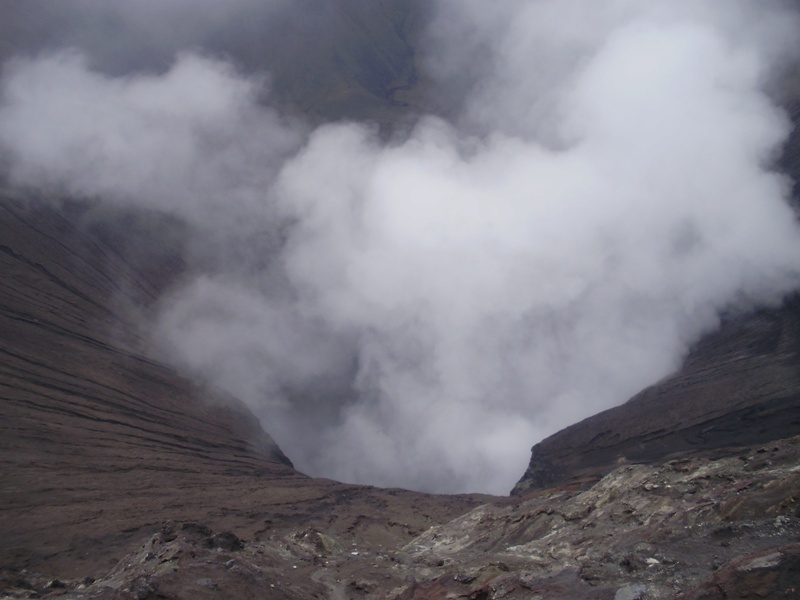 Mount Bromo is one of the most visited tourist attractions in East Java. At 2,329 metres (7,641 ft) it is not the highest peak of the massif, but is the most well known volcano. 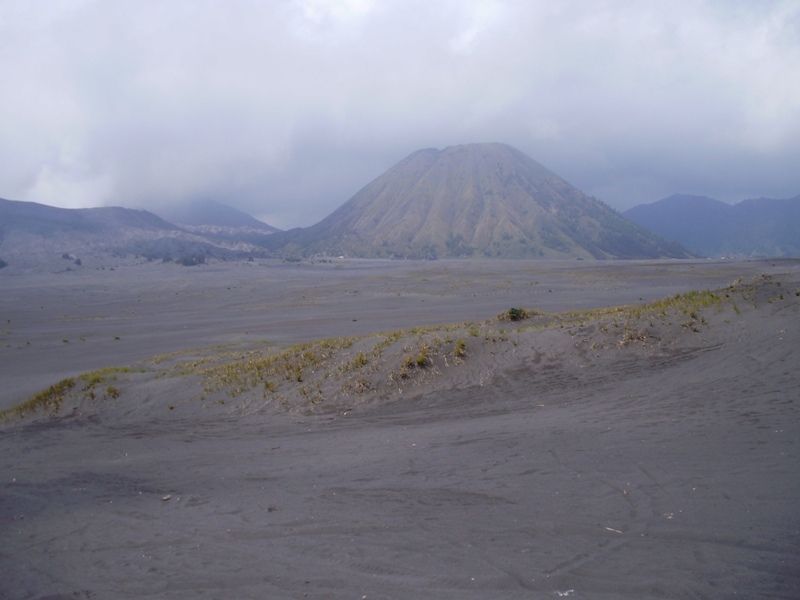 Mount Bromo lies in the middle of a vast plain called the “Sea of Sand”, a protected nature reserve. 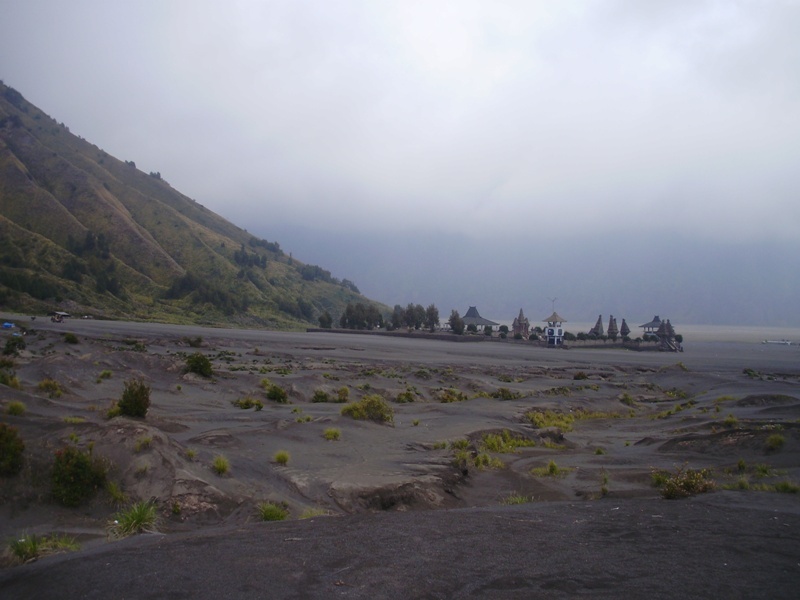 The typical way to visit Mount Bromo is from the mountain village of Cemoro Lawang. From there it is possible to walk to the volcano in about 45 minutes. 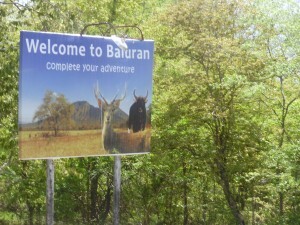 It is also possible to take an organised jeep tour. 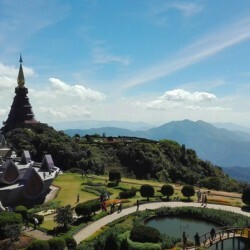 Tour usually includes a stop at the viewpoint on Mount Penanjakan (2,770 m or 9,088 ft). 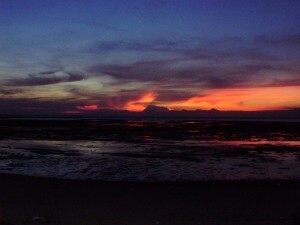 The viewpoint on Mount Penanjakan can also be reached on foot (two hours). 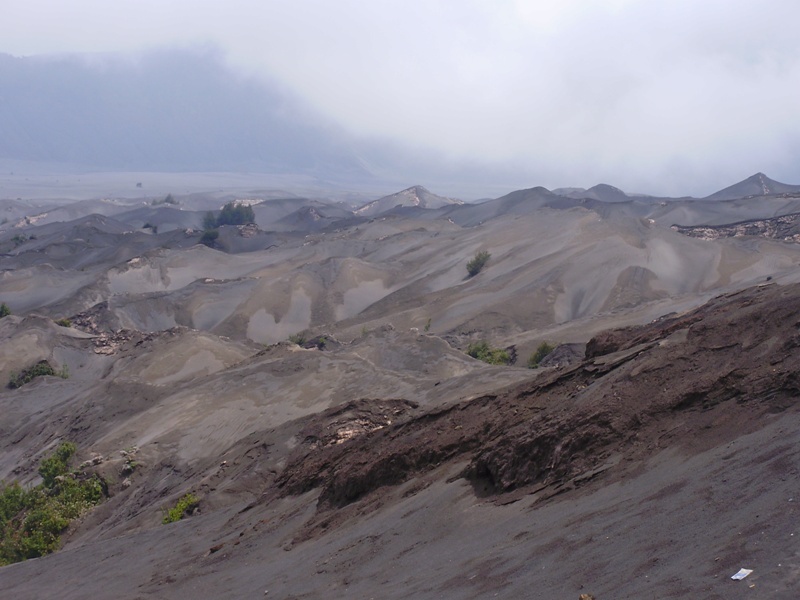 Depending on the degree of volcanic activity, there are sometimes issues warnings against visiting Mount Bromo. 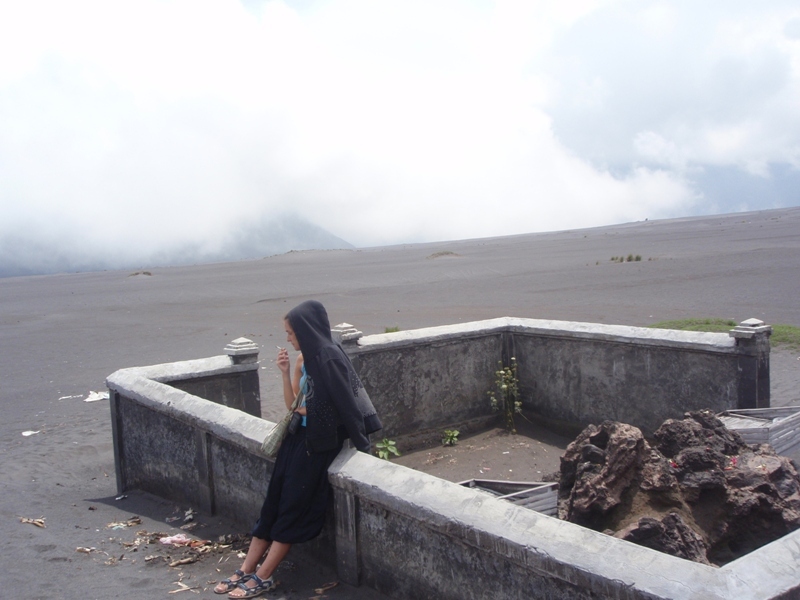 From Baluran national park we took the bus to Probolingo, which is the nearest large city near Mount Bromo. At the bus station we asked travel agent how to get to Cemoro Lawang. He offered us trip with groups. We refused, because green and blue 10 seats Mini-Buses from Probolinggo to Cemoro Lawang are located right outside the terminal. It costs IDR 30,000 per passenger. Mini-buses departure from the terminal bus station as soon as the bus is full. We waited for a while and other tourists came and joined us. But be careful, after 16:00 it’s quite hard to get enough passengers, but it is possible to negotiate for a whole minibus at IDR 200,000. 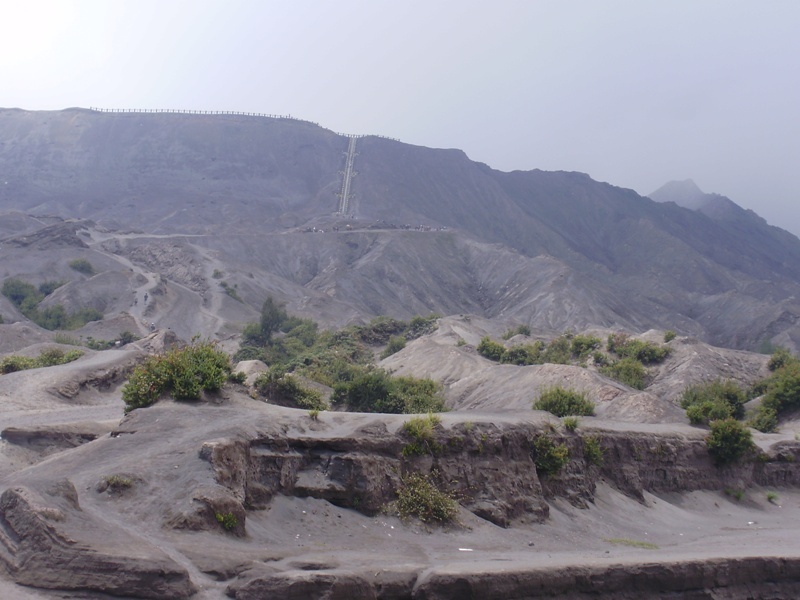 In the gate to Mount Bromo we paid entrance fees IDR 75 000. 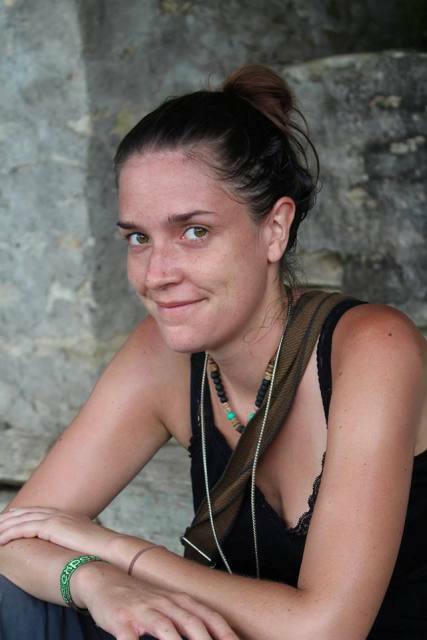 But in early May 2014 it has increased from IDR 75,000 to IDR 217,500 for foreigners . When we arrived to Cemoro Lawang it was already dark and very cold. 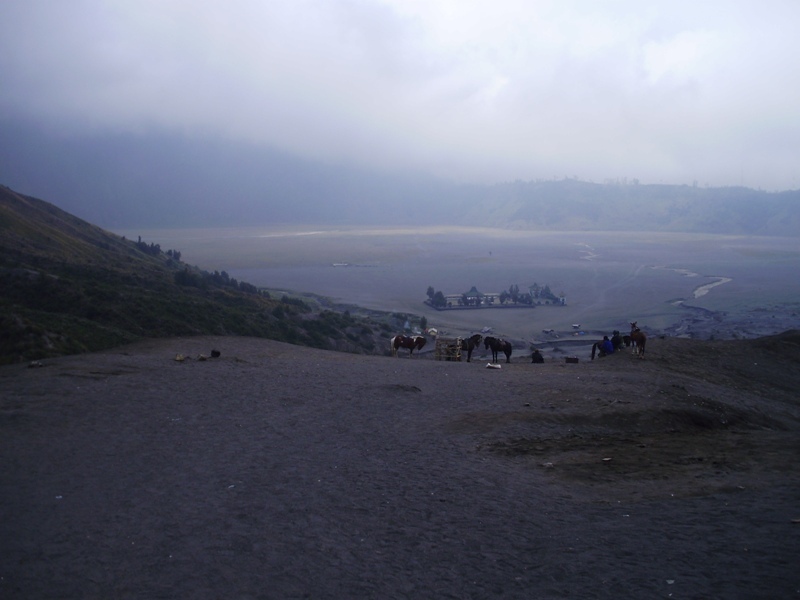 At Bromo temperatures are refreshingly cool during the day but outright cold at night. Temperatures can drop to zero in the dry season and are rarely much above 5°C in wet season. A long time we could not find a nice accommodation. Everything was dirty, cold and overpriced. 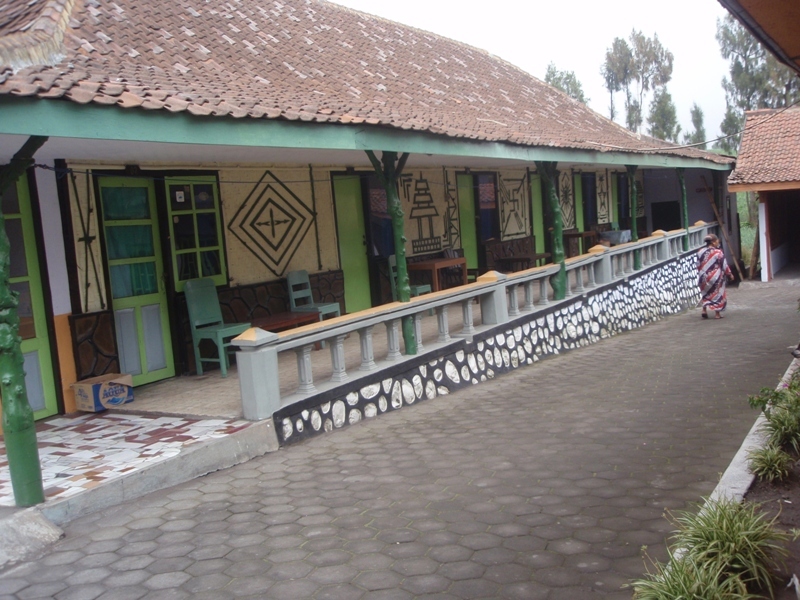 Finally, we decided to stay in a better room in homestay Tengger Permai. 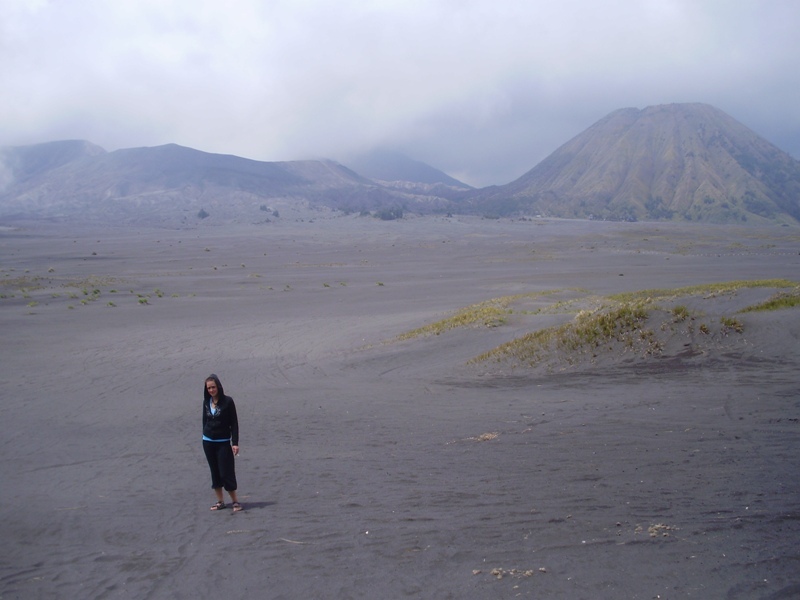 The next morning we went visit Mount Bromo and sea of sand. We walked to the volcano about 1 hour. 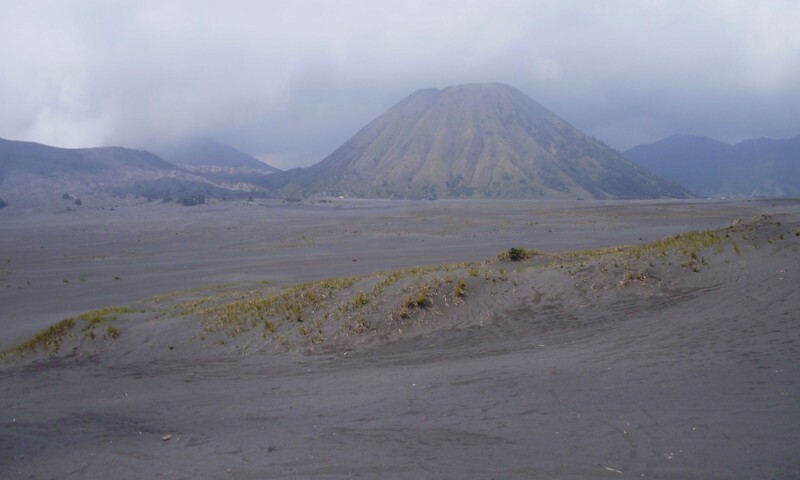 We were alone there, because we did this trip to Mount Bromo without tour. No tourists, no people. 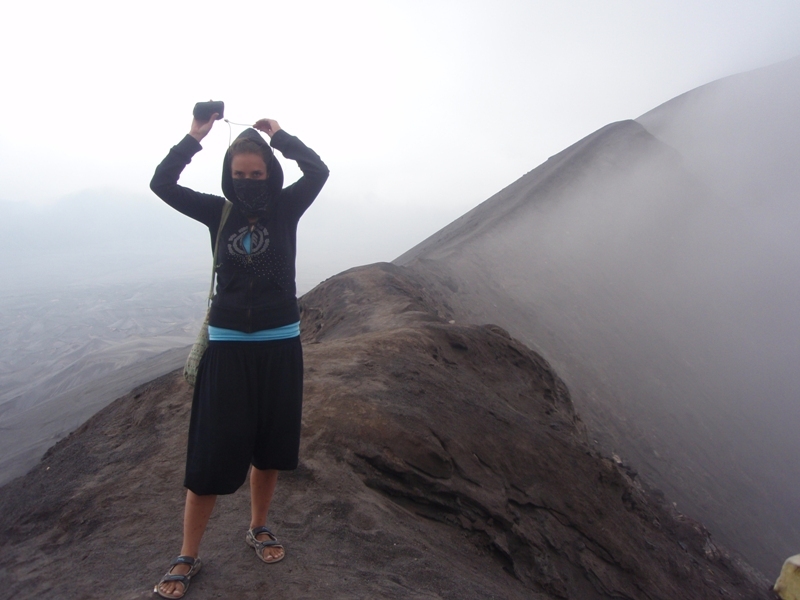 All tourists that took organize trip went to Bromo early in the morning, in the group climb to the volcano and went back. We enjoyed everything by ourselves, alone. On the way we saw only horse riders in the canyon. 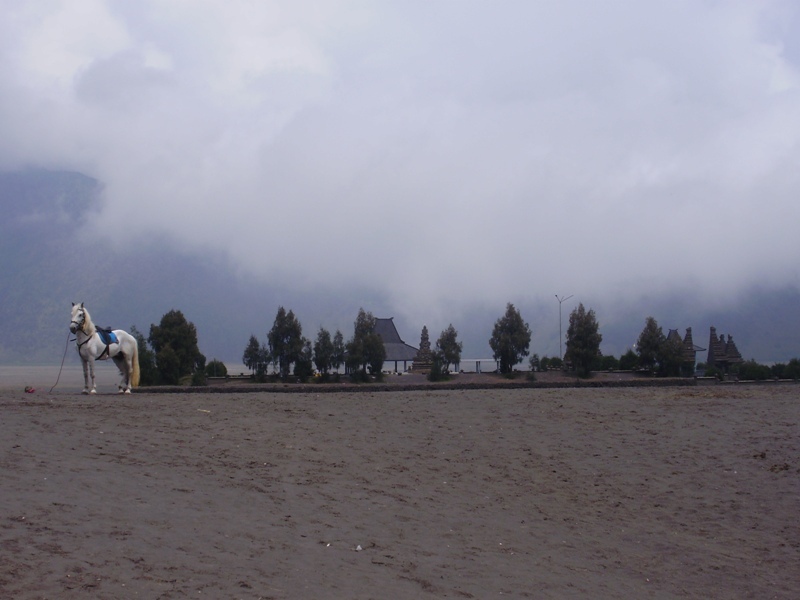 Near Bromo, on the sand plain sits a Pura Luhur Poten. 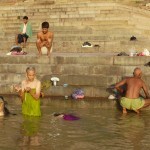 This Hindu temple has a significant importance to the Tenggerese scattered across the mountain villages. The major difference between this temple and Balinese temple are the type of stones and building materials. Pura Luhur Poten uses natural black stones from volcanoes nearby, while Balinese temples are mostly made from red bricks. There are several buildings inside and enclosures aligned in a mandala zone composition. 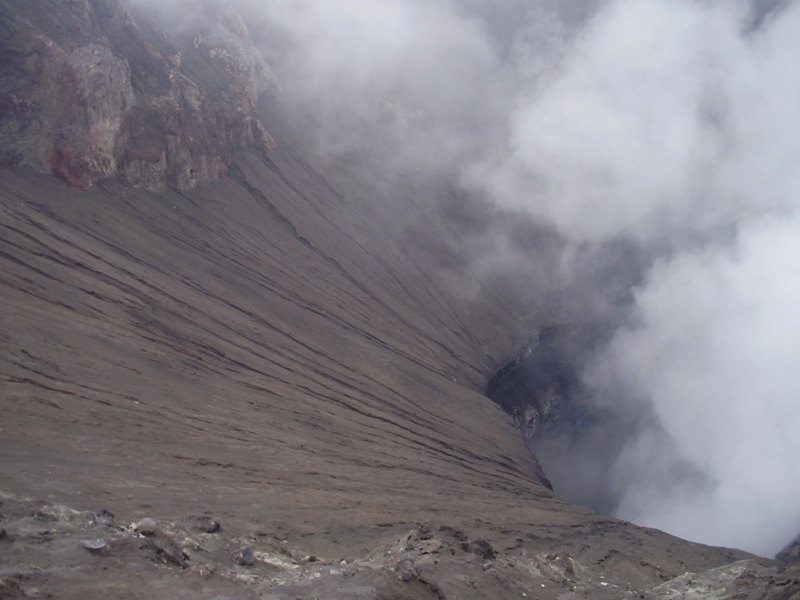 Than we climbed up the 245 steps to the rim, also called “the stairway to heaven” to look into the bottom of the crater. We were alone there again. Inside the crater there is a lake that was created in 1938. I could stand there and watch power of nature forever. 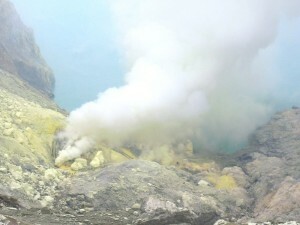 Crater roars, water splashes, sulfuric fumes rising. You can feel that place is alive. 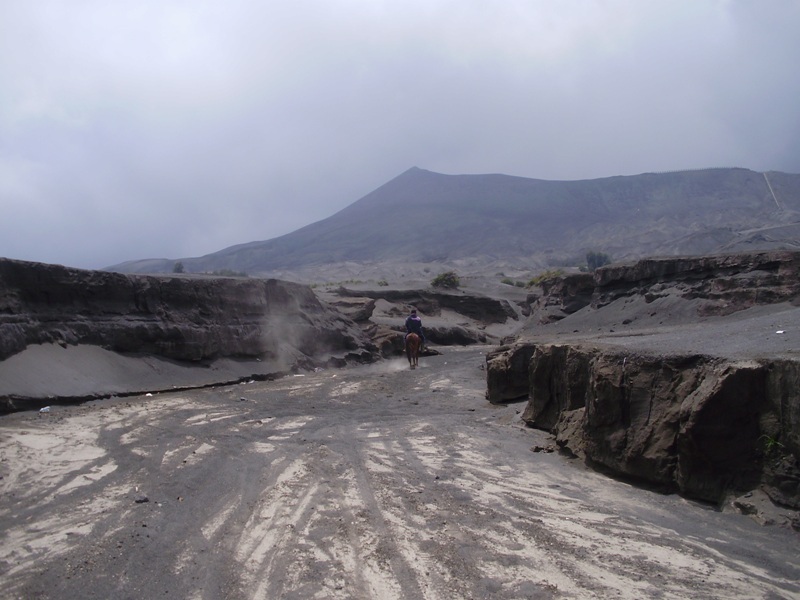 We went down and rest of the day we spent at “Sea of Sands” – huge, unearthly moonscape of a caldera. When you walk there you can sometimes feel hollow spaces underground. They were created by lava. Lava flows created huge underground tunnels. We went further and further into the gray landscape of nothingness. We were barefoot and had amazing feeling. In the evening we went back to homestay. When we rested outside the guest house, we were still in the unwanted company of vendors of warm clothes like hats or gloves. My Spanish friend put his tablet on the table in front of the guest house. Suddenly he realized that tablet disappeared. Someone stole it. We remembered last vendor. He acted weird from the beginning. He didn’t want to leave us alone even if we asked him for that. We tried to resolve the situation with the owner of homestay. First day she was nice to us, but her behavior quickly changed when we explained situation with tablet. She didn’t want to help us. She lied us and was arrogant a very unfriendly. We went to the police station. When we got there, we saw suspicious vendor there. They weren’t willing to help us. Everyone just laughed. We understood that the villagers are one big mafia. They all are connected. If I had to decide today how to organize my trip to Mount Bromo, I would follow this schedule. I’d stayed the night in Probbolingo. There are some good quality hotels (we were inside while we waited for a bus) near bus station, which are much cheaper than accommodation in dirty and cold rooms in Cemoro Lawang. 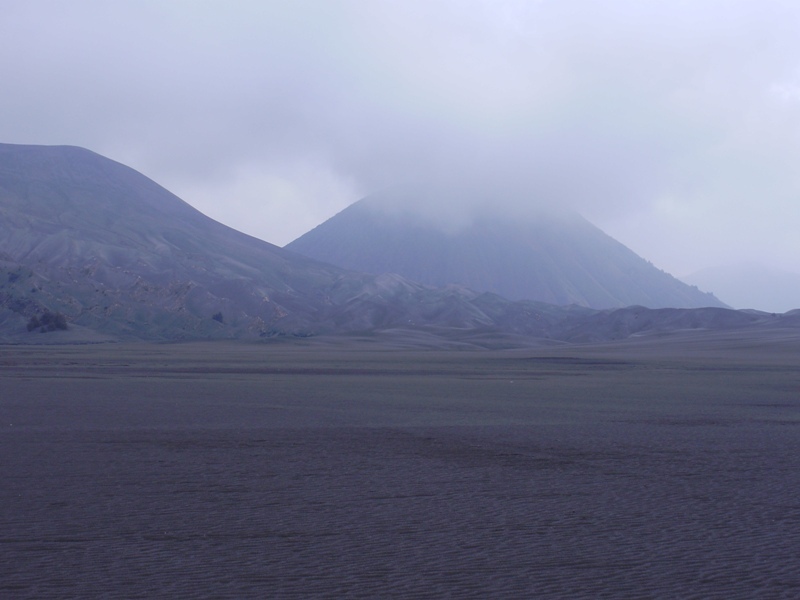 The next morning I would go by minibus to Mount Bromo, where I would spend the whole day and in the evening I would go back down to the hotel in Probolingo. 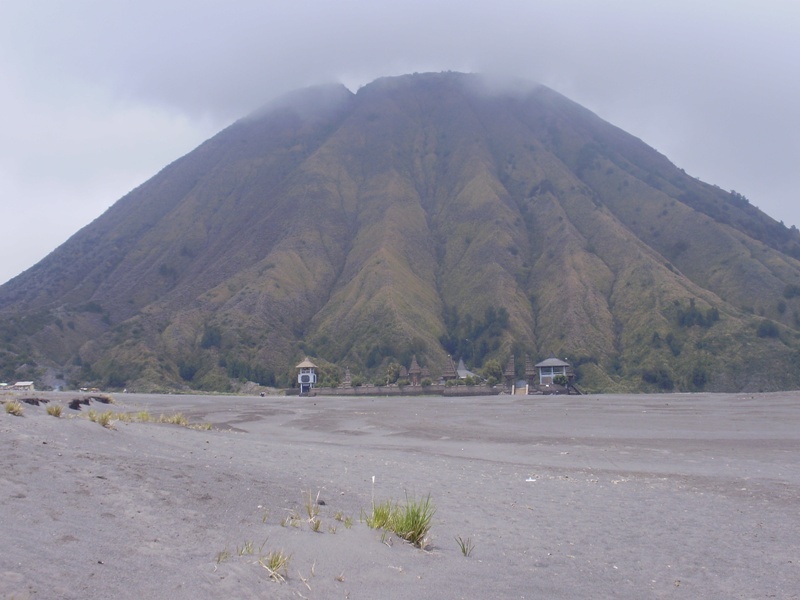 Despite the incident with tablet that happened to our friend I consider our trip to Mount Bromo and beautiful See of sand as a very positive experience. 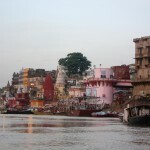 Nice to resd & view your post, good pictures. We need this info. 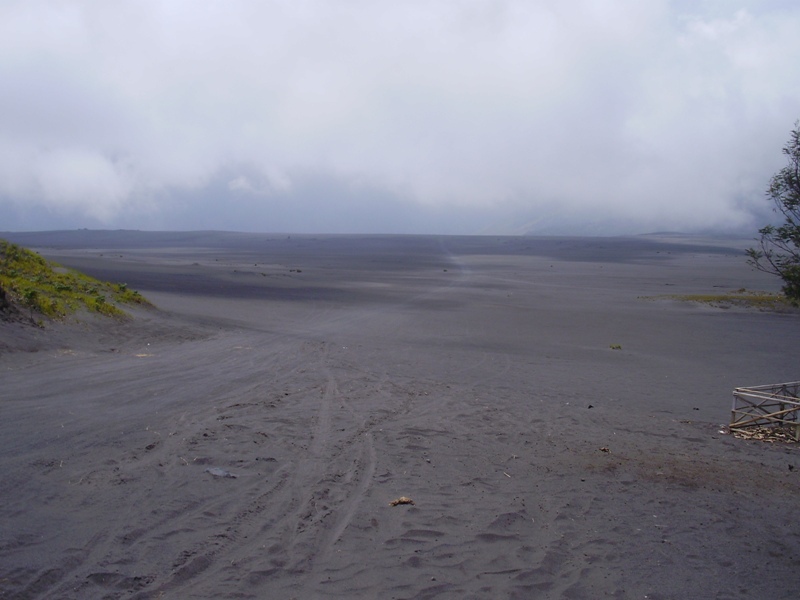 How wide is this sea of sand, how much is the distance from the time the 4 wheelers leave you to the stairs of Bromo. We are above 60 and shall be visiting indonesia. Need this info as our tour operator cannot guarantee avalidity of horse.